This review has long been in the making. I apologize for the waiting readers but I wanted to make sure my assessment is of general consensus. After all, releasing a follower to the legendary DT 990 is nothing to take lightly. DT 1990’s smaller sibling has been an easy recommendation for over thirty years and everybody is hoping ‘The New One’ is here to stay too. The build quality of the new DT 1990 PRO headphones is simply superb. They feel amazing in the hands and on the head. There really aren’t many companies with the experience of Beyerdynamic and here it really shows. While Beyerdynamic did not use any luxurious materials like wood or real leather, all of the parts function extremely well and add to a more than solid build quality. The ear pads feel soft, the headband distributes the weight nicely, the replaceable cable snatches into place and the ear cups feel amazing in the hand too. This is one of the best-built headphones I have ever come across. The design is unique and Beyerdynamic tried something new with the grills of the open-back design. The metallic logo on the black aluminum cups just looks gorgeous and if anything, the design is simply a manifest of the precision build. Humble black and dark gray tones allow small accents like the white stitches on the pleather headband. Visually, I easily prefer the DT 1990 PRO to their newest release Amiron or anything released prior to the closed pendant DT 1770. How cocky do I (as a compatriot) sound if I say that I am very proud to read “Made in Germany” on the outside of these ear cups? 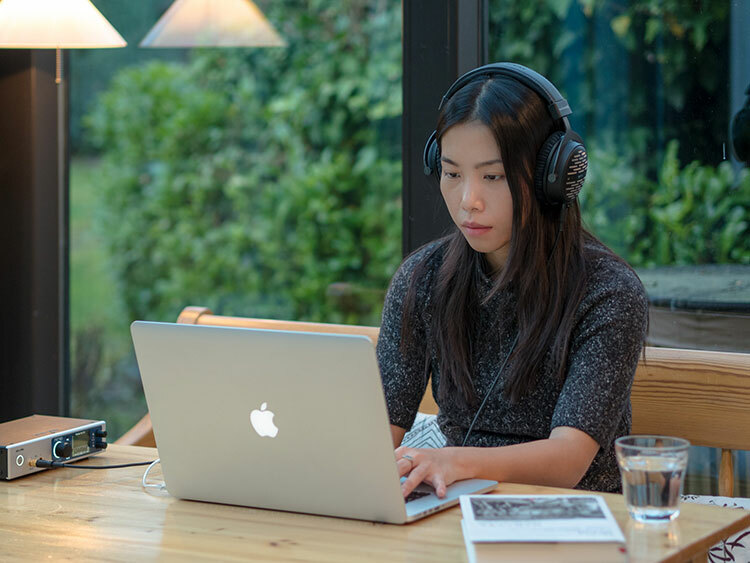 As an open headphone, you should not expect much isolation. There is no way I could recommend the DT 1990 PRO for portable use or even on train rides. Even at home I never missed a phone call or overheard when somebody came knocking on the door. More so, I was bothered when neighbors were outside. Ideally, the 1990 is used in a very quiet environment; say something like a studio. Leakage is similarly poor, allowing my girlfriend to hear everything that I heard. Comfort wise, I have no complaints at all. The Edition series of the legendary trio; the DT 770, 880, and 990 were long known for some of the most comfortable headphones. The DT 1990 leans closer to the PRO builds of said headphones, applying stronger clamping force. However, Beyerdynamic used comfortable foam padding on the ear pads and the headband making it one of the most comfortable headphones, in my opinion. 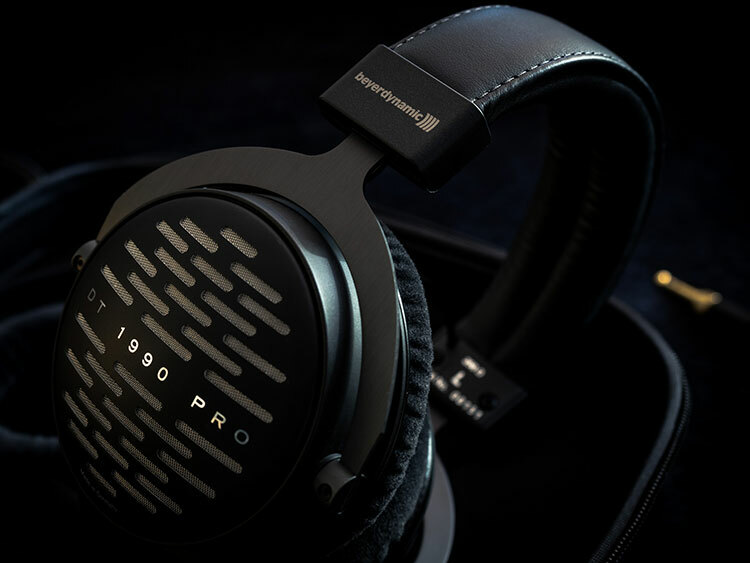 The DT 1990 PRO won’t make you forget that you are wearing headphones, but they will make you appreciate Beyerdynamic’s experience. If you like to wear headphones, these are for you. 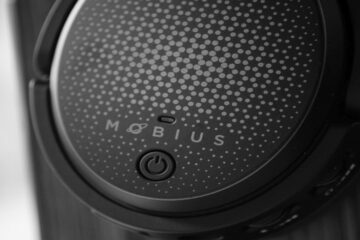 The headphones come in an all-black rubberized transport case that offers enough space for all accessories. A little zipper pouch is attached on the inside for a second cable and also the 2nd set of ear pads has its place cut-out for convenience. The box is a little too big to carry in a messenger bag and it will take almost all of the space in a backpack. But if you travel by car, you will be happy to have the case in your trunk to safely protect your headphones. The included two sets of ear pads are not the same. They are supposed to give the DT 1990 PRO different sound signatures. They’re labeled EDT 1990 B (balanced) and EDT 1990 A (analytical) for your convenience. Next to the warranty information and a multi-lingual instruction manual, which might come in handy to identify the ear pads or to check up on how to clean them, we find two different cables. 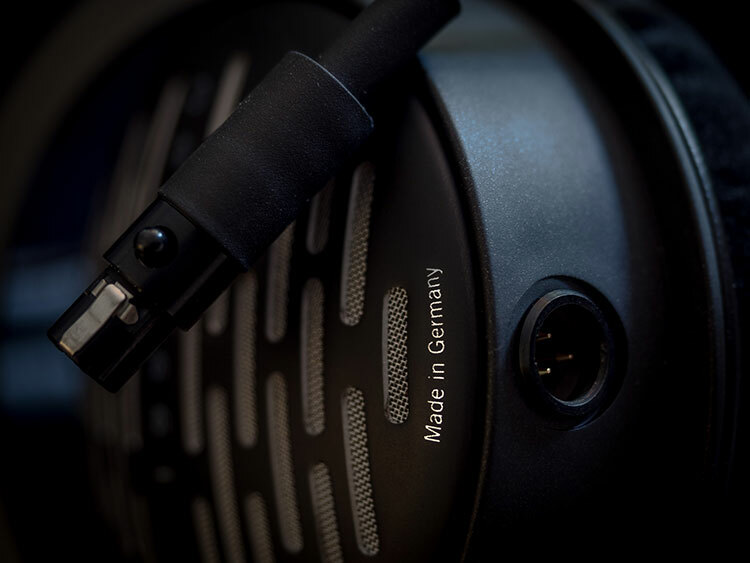 It is nice to see that Beyerdynamic included two different cables. Both have a solid thickness and appear to be very durable. The rubberized surface feels sturdy and matches the build quality of the headphones themselves. However, neither offered a perfect solution for my personal use. The straight cable has a nice length of three meters. However, the memory is very strong with this one and during the very long review process, it did not want to straighten itself, making me lose around 50cm effectively, making it less comfortable to use on the couch. The coiled cable seemed to be a great match for desktop use at first. Sadly, it is extraordinary long at five meters. In most scenarios, you will have a nice cable bundle in front of you. But what’s more, those five meters have quite the weight. Adding the same strong memory from the straight cable, I felt like the coiled cable limited my movement a lot more than it should and when I stood up, the weight would move the headphones position on my head. I think Beyerdynamic should revise their default cables for the new 1770 and 1990 PRO line and put usability ahead of build quality. Out of the box, the DT1990 needs around 200 hours burn in for it to sound optimal. Interestingly, the original DT 990 which was my first open headphone from Beyer has not so much in common with the new DT1990 sound wise. 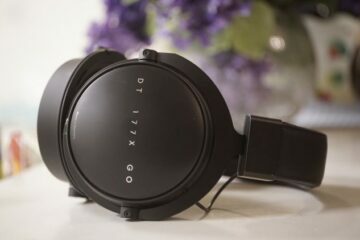 The DT 1990 are slightly v-shaped with an enjoyable amount of bass but also some analytical treble energy that gives it a somewhat sterile sound character overall. 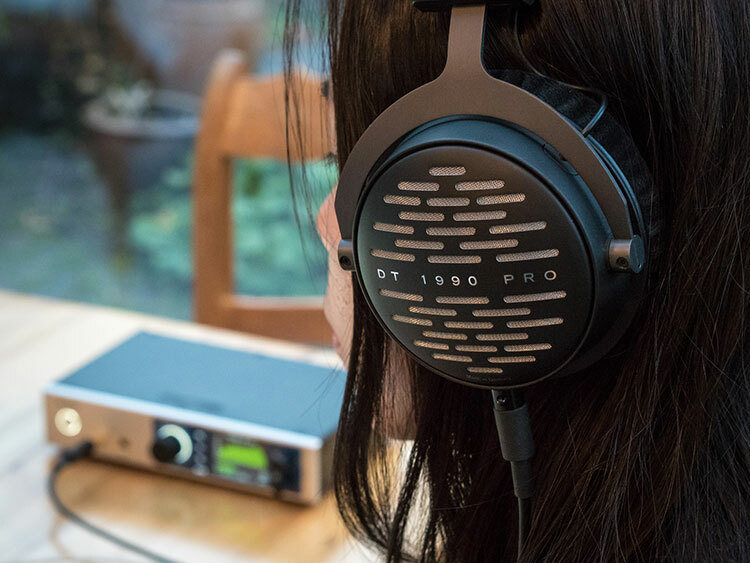 Whereas the DT 880 – when disregarding the infamous high-frequency Beyer-peak – sounds very natural to my ears, the DT 1990 drifts more into a neutral sounding territory. However, the sound signature depends on the ear pads to some degree. 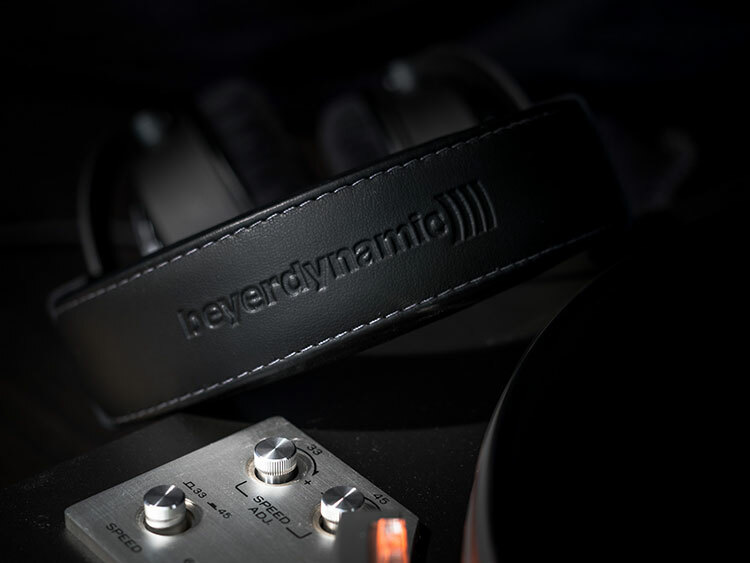 Luckily Beyerdynamic includes two different sets of ear pads for users to chose their preference. The DT 1990 PRO come shipped with an extra set of ear pads. But these are not simply for backup purposes. Either set has its own sound character. Simply put, the pre-installed EDT 1990 B “ensure a sound with a slight bass boost” (quoted from the manual). Personally, I prefer the EDT 1990 A (A for analytical) that need to be mounted on your own. Unless emphatically specified, the following review has been written while listening to the analytically tuned DT 1990 PRO. I will revisit the comparison after a detailed look. I really like the bass performance of the DT 1990 Pro. They have a nice amount of punch but without any boom or slow rumble. Yet they have deep and linear extension despite being open-back headphones. There is even a nice amount of rumble though never overpowering. When asked for, the bass can create nice weight, too. Luckily the bass does not bleed into the mids. Phrased positively, the midrange is neutral in an analytical way. Male voices can sound realistic and come by as rendered nicely. However, with higher pitched voices, the high detail from vocal recognition can become overpowering. To my ears, the percussive attack is too much and consonants hit too hard. Electric guitars can be edgy and come by as too harsh. Finger snapping also sounds hollow and empty. I have to be honest here and there is simply too much higher mid energy for randomly shuffling music. There is little to complain when listening to well-mastered audio, though. I really enjoy vocals, flutes and even trumpets on audiophile recordings. Clarity and definition can be phenomenal. Just make sure your source allows enough headroom. The analytical character of the upper midrange and lower treble continues on in the higher frequencies. The DT 1990 treble extension is excellent however, Beyerdynamic has always been famous for a little bit extra treble energy and I have been referring to a boosted top-end as a Beyer-peak. Just as with the vocal presence peak, Beyerdynamic unsurprisingly did not shy away from 7-8 kHz and at times this can come across as a little sibilant. The same that I said about the midrange is true for the treble too. It makes it uncomfortable to shuffle through media, but it also absolutely works with great recordings emphasizing on great definition and crispness. The soundstage is vast and very deep. The A pads pull the audio closer together whereas the B pads can create even more depth. Voices are set back a bit, but they have great room to breathe and stand their own. Regardless of which pads you choose, the stereo separation is strong. The boosted crunch and definition from the tuning result in amazing resolution. Instruments are separated with ease, though overall sounding a little too light-weight for a natural sweet flavor. Dynamics are also flattened a bit more than I would wish for. As you can take from my detailed look, the DT 1990 PRO wowed me most with low-end frequencies. The punch and tightness are very good and I am impressed by low-end extension for an open headphone. Going with the balanced pads, some more rumble will be apparent and thus atmosphere will improve with some recordings. I do not think that the bass boost is overdone. However, it mildly accentuates the presence peak in a psycho-acoustical way. Were the 1990 shipped with the B pads only, I probably wouldn’t mind at all. However, I decided that I personally prefer the A pads. They bring vocals closer to the listener and the overall tuning is more neutral and closer to reference. Most importantly, the bass loses none of its qualities. The DT 1990 Pro’s Tesla driver is easier to drive than the original DT series. Volume is easy to push high but this Beyerdynamic asks for a lot of control. Unamped, the sound can be pleasing but one would miss out on most of its strengths. Amplification is recommended. The Lake People combo set together from RS 06 and either RS 02 or 08 amp results in amazing linearity. The improvement of dynamics is incredible and Lake People gives life into the mostly analytical monitor by Beyerdynamic. The DT 1990 asks for quickness and accuracy above all and I do believe this is a very recommendable sonic match, much more than using a tube amp and trying to bend the 1990 into something it’s not, e.g. 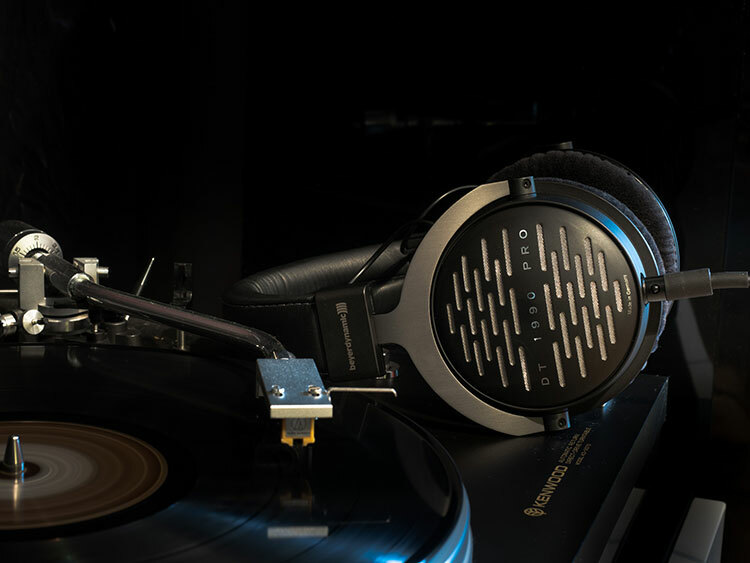 a warm and analog sounding consumer headphone. Also visually these pair formidably. It almost seems as if these devices were designed from the same hand. Black outweighs the small thin-lined details that add aesthetics to either product. Both put build quality over luxurious materials and Lake People and Beyerdynamic seem to aim for the same goal. Not toying with any DSP effects and using the stock configuration, the RME sounds shockingly similar to Lake People. Based on the DT 1990 PRO alone, I could not tell the amps apart in a blind test. This combo also plays highly transparent but mostly won me over thanks to the equalizer and crossfeed. The separate bass and treble knobs basically replace the trouble of replacing the ear pads for different sound signatures. The ADI-2 Pro is a more than safe recommendation, although not necessarily linked to Beyerdynamic’s DT 1990 Pro. Building From The Beyerdynamic DT 990? After I replaced my DT 990 Edition with the 880 many years ago, my memory of its tuning started to escape me. Right now I only have a limited version released as Avinity AHP-967 in my collection. It’s basically a DT 990 with some T90 design elements and a very thick and stiff cable. My comparisons are based on this rebrand, so do keep that in mind. The overall balanced signature is much less pronounced on the reference DT 1990 Pro. The new version is tuned closer to a linear standard. However, the “Pro” aspect of the 1990 shows too. It is less forgiving and even emphasizes on low mastering quality. The 990 is much more consumer oriented and – I want to say – pleasing to the listener. Though the original 990 balances the stronger bass in the top treble, it is nowhere as forward or fatiguing. The DT 1990 blasts the DT 990 to smithereens when fed with high-quality audio. The layering and resolution on the bigger brother are clearly at least one class above. I do find the 990 scales very well with solid amplification and it continues to deserve a solid recommendation. The 1990’s Tesla driver is easier to drive but it’s also not a headphone I would use unamped. In a clear and crisp audio chain, being fed audiophile recordings, the DT 1990 can really stand its own. For the average consumer, I would rather recommend the original DT 990 instead. How do these compare to the HiFiMan Sundara? Thanks. I have a hard time taking any “reviewer” seriously who perpetuates the burn-in myth, let alone 200 hours (!) of burn-in. Top of the first page? I agree, it would be handy for your viewer if you could put a score on this to quantify its aspects against the others… I’m on the market right now, choosing between focal utopia or beyerdynamic dt1990 pro. I’ve tested both, and focal is just much richer sounding, seems to be every note is fatter… but dt1990pro is also clear at hell… you could hear all the same things but sounds tinnier.. what’s your thought about those two? I tested the dt1990 y t5p 2nd and the more difference is in transparency! T5p es really trasparent with my DX200 mote than dt1990, and thr highs are amazing! I hope you can help me find a fitting headphone. I partly stream my music from spotify and listen to losless ripped CDs. Different genres like folk, americana, pop, soul, r&b, rock (virtually never classical, jazz, metal, hard rock). I live in Europe where I could buy the DT 1990 for 500€ and spend another 200€ on a DAC/amp combo. So you would not recommend these headphones to me? (considering my sound files and not having too much money for an amp). Would you rather recommend opting for a Sennheiser HD650/600 or Beyerdynamic DT 990/880 with some amp/dac? Going by your genres, it seems you dodge most high quality recordings. The DT 1990 can be less forgiving with clipping or low dynamic mastering. The DT 1990 excels with high quality Jazz and Classical recordings, IMO. Going by the source, I would look into the HD 6XX and invest the rest of your budget in a DAC/amp.